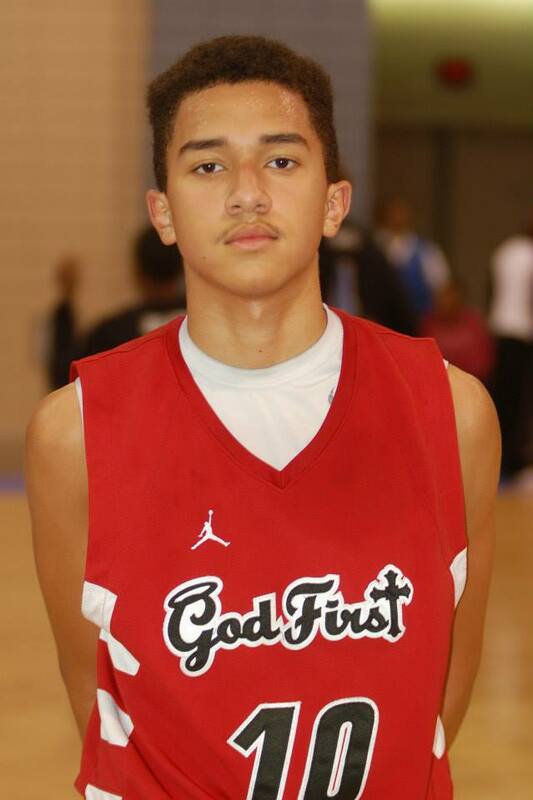 Gunning For #1: Lone Star State's LeBlanc Bringing His Game To The Future Phenom Camp! A lot of big time talent has been coming out of Texas recently at the college and pro level; Leblanc is another example of the Texas machine. Isaiah has all the physical tools, a diverse skill set that allows him to be a multi-category contributor, and the genetic pipeline that will have him playing two-levels at the division one level. Leblanc plays the game the right way, has solid mechanics, and is dedicated to the process of improving. He will hurt you from all three levels and is his very best when the pressure and the stakes are at its highest. Pressure burst pipes but it also makes diamonds and Leblanc is no cubic zirconia he is a real true VS rated player and he will be shining for the world to see come August 22nd and 23rd. When Leblanc steps into the gym the scouts immediately check out Leblanc’s cut, clarity, color, and carat if you can handle him watch your value expand nationally exponentially. Isaiah shoots well enough to space the court, passes well enough to make defenses pay for helping on penetration or close outs. He finds gaps off penetration and can stop and pop or use the floater game to finish. Big enough to guard multiple positions he is dedicated equally on both sides of the ball. An excellent rebounder who can fit into any system and help a team win – very complete player who still continues to develop additional facets to his game. 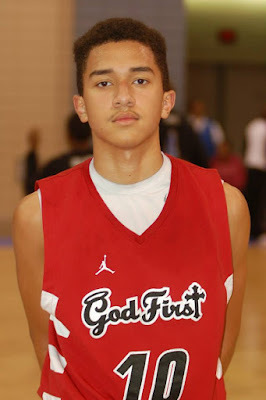 If you love basketball you will love Isaiah LeBlanc if want to play against the best you will be at Spotlights Future Phenom Camp. Gunning For #1: Keels Will Be On Their Heels At Future Phenom Camp! 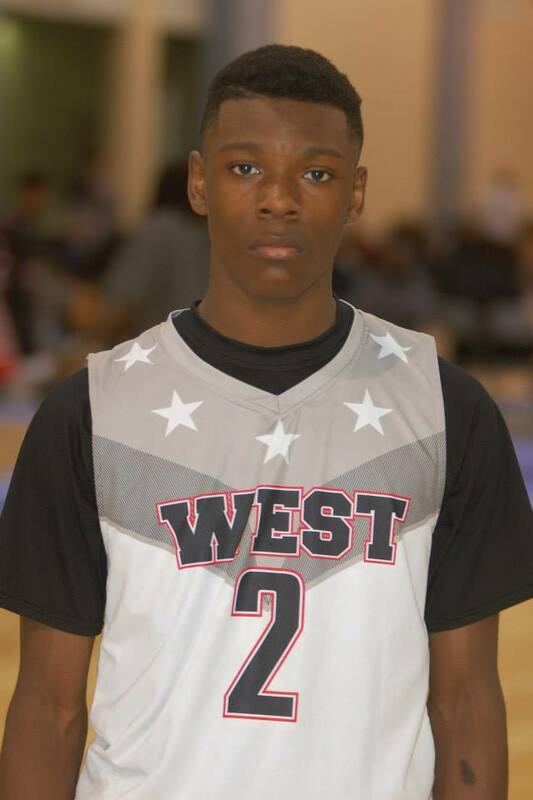 The Swiss army knife of the 2021 class, Keels can play face forward and with his back to the basket. He can post you and break your press, he can facilitate and he can finish. He is a full buffet of talent and impacts the game positively every time he takes the floor; and he can change the game without scoring a single bucket yet he has the talent to drop a 20-spot on you real quick. Possessing great size, and diverse set of skills – if you don’t respect him he will find you and he will “kill you”; the name has been has been under the radar for some time but no more. Trevor’s time is now and he’s prepared for the target being on his back and he is prepared for the Spotlight – but keep in mind he will have a target on the competition too, so step lively keep your eye open cause he has a certain set of skills that will have you guessing where he will come from next. More of a natural small forward he is a skilled enough that can play all three perimeter positions. He is a great passer with excellent court vision and is a good decision maker and is probably best playing a 'point forward' position where he is a match up problem that no team or player can solve. Wonderful mechanics and willingness to rebound and play both ends of the court ensure he contributes and looks good each time out. He will be there this year not to make a name but to scratch a few off only show up if you can handle the truth because Keel is nothing but. 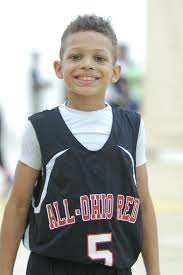 Gunning For #1: Isaiah Kennedy Representing Ohio At Future Phenom Camp! 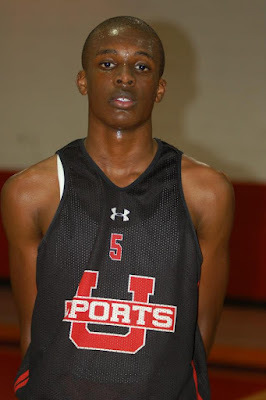 Peel back the skin and you will see that this kid has wires inside, he is a workout warrior and a machine that has been programmed to seek and destroy; Kennedy has a great feel for the game and can be counted to be a coach on the floor. A General who takes orders, gives orders, and makes such that the mission get accomplished. A shooter who shoots the same shot every time can knock it down from anywhere. A great frame and strong body allows him to not be knocked off course and get to anywhere he want to on the floor is also one of his best assets when attacking the paint and the basket – he finishes what he starts and does so with class personified as he respects the game and is a student of it. He comes to the Spotlight planning on teaching some folks a few things and move to the head of the 2020 class literally; if study long you will study wrong come prepared for the Kennedy test because he will be looking to fail anyone who steps into his classroom. Ultra-strong athlete who is diligent in affecting the game with his assertiveness and IQ – great strength, quickness, and an all-out all the time motor makes him a maven on the both ends. He pushes the ball well in transition, kicks out passes in a timely manner, and he scores it well from all levels and has a creative finishing package which includes pull-ups and floaters. Coming from the Midwest the rumor is that a chip has developed on his shoulder and he has something major to prove to himself and the rest of the country. 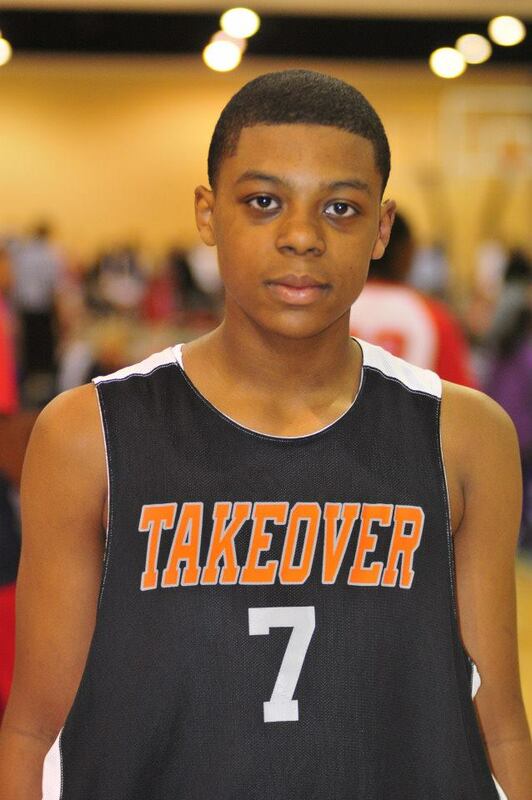 One of the most special and exciting players regardless of class has to be the “King” who was introduced to the nation at last year’s Basketball Spotlights Future Phenom Camp. Prior to his arrival his intent was clear he was laser focused on becoming the top player in the class – well people in the desert want ice water too; so when Thurmond took the floor he couldn’t request what he wanted he had to take it; he was forced to kill what he ate – and eat he did putting on show each and every time he took the floor. He showed a complete game and skill set that included much more than scoring, he dished it, he defended, and most impressive was his communication, leadership, and will to win. He is a born leader and winner and looks like he has played this game before, he’s an old soul who stays in the gym working on his craft and has no plans whatsoever of relinquishing his current position as the #1 player in the class. He is not running, he is not hiding he will be in attendance August 22nd and 23rd to prove he is still that guy, the message if you want his spot come and take it! Khoi is constantly in attack mode on the offensive end of the floor. He leads the break and can finish on the break equally as well, he gets to the rim at will and proved he knock down open or contested threes. His mid-range is strong and he has next level confidence in his game. Even with such a diverse skill set and high level of offensive talent Khoi would rather set up a teammate to score, a young player who understands the value of making those around him better. For those that understand the value of playing against the best it gets know better than the “King” and it gets no better Basketball Spotlight Future Phenom Camp. Gunning For #1: Rising Carolina Star Cone Ready For Spotlight Camp! Nothing could be finer than this next level shooting guard with the pro-style game from North Carolina who has made a commitment to give the nation the business at the Basketball Spotlight Future Phenom Camp. 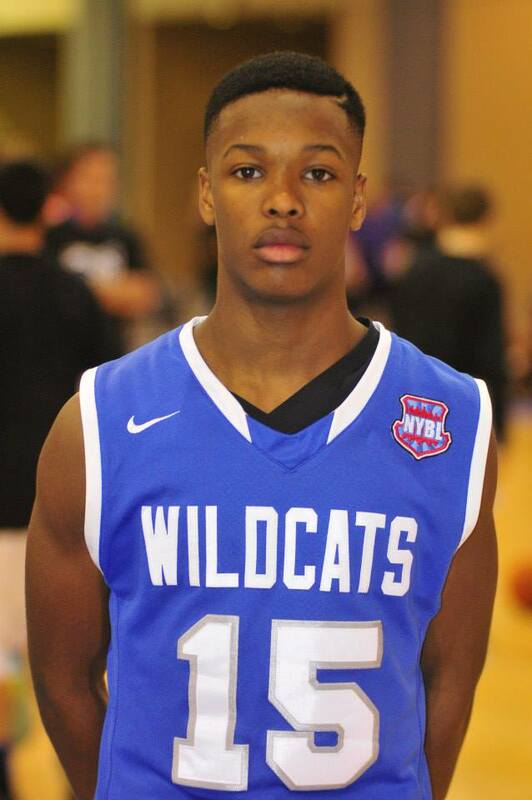 Watch his for five minutes and you know the kid is a problem, he gets is done with great efficiency while shooting a high percentage and can hurt you anywhere on the floor – he finishes with a combination of strength and athleticism, but most importantly he does it with a skill set that has been honed from hours in the gym. One of the nation’s best players but also one of its hardest workers, Cone stays ready. A very mature and seasoned guard, he will impress equally with his IQ as well as his offensive prowess – a natural jump shooter with a ton of bounce he can create his own space and works well in it. Love the style and combination of shooter & scorer who does in it in the context of the offense. Cone has be considered a problem waiting to happen; the problem has occurred who will fall victim at the Basketball Spotlight Future Phenom Camp. Gunning For #1: Michigan's Towns Taking On All Comers! He shifts gears and plays without fear; a blur that comes at you at 100 mph Towns only know one way to the play the game and that’s at full speed. In the class of 2023 you must consider the combo guard as one of the top guards in the nation. Three level scoring ability; combined with a solid push/pull game that is further accentuated by his ability to penetrate and finish. Solid off the catch he is one of the few at the age that can work off the bounce and is remarkable uncanny at scoring off the dribble. Last summer the Basketball Spotlight Future Phenom camp, Jakhary came in with much national hype using the Spotlight as his stage he solidified his reputation on the court removing any doubt that he was who he who he said he was. We love the passing ability of Towns who is a great passer with excellent court vision and exhibits good decision making – long term we like him as a 21st century scoring lead guard. With a diverse skill set for such a young guard, there is no one that competes or plays harder than Towns – great natural instincts and anticipation offensively combined with the ability to create space and scoring lanes for himself and others forces defenders to be on high alert anytime the rock finds itself in his hands. The ability to shoot a high percentage from beyond the 3-point stripe with the aforementioned make him one of the toughest covers you will see. Think you can guard him? Prove it August 22nd and 23rd National Scouts in attendance will be watching, the Jahkary camp has been working hard and expects it to simply to be another night on the Town! Gunning For #1: John Mobley Jr. Makes Move To Spotlight Stage! The nations #1 player in the class of 2024 hasn’t done anything to relinquish the title; playing up two to three age groups all season long he has continued to put together jaw dropping performances and display a skill set that rivals any player in any class. His play is not reliant on physical attributes; it’s built on the foundation of skill, IQ, speed, and agility all transitional traits that will serve him well on any level he plays now and in the future. 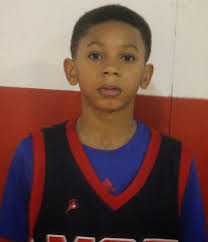 From a pure basketball standpoint he is one of the most advanced and skilled players you will see on the circuit and he will put it all on the line August 22nd and 23rd at the Basketball Spotlight Future Phenom Camp. Like a championship prize fighter he is taking on all challengers for his title and anyone who desires to be in this conversation must come see him – they all will have the chance come August if they are truly up to the challenge. With moves on moves and counters to those, he relentlessly attacks the opposition, stopping on a dime and using all the angles to his advantage. Even at this young stage he operates beyond the stripe, in the mid-range, and already owns a solid pull up game and floater package to go along with his sick range. Difficult to impossible to stay in front of this guy will flat out punish you with the rock in his hand. Do not let the tiny frame fool you – he is a finisher who does it with both hands and shows phenomenal body control. Scouts will be on the sideline to see what the 2015 version looks like meaning those vying for a top 2023 spot will have every opportunity to prove there are who they think they are – are you the Future Phenom or will Mobley remain undisputed, find out in less than 30 days if you dare. 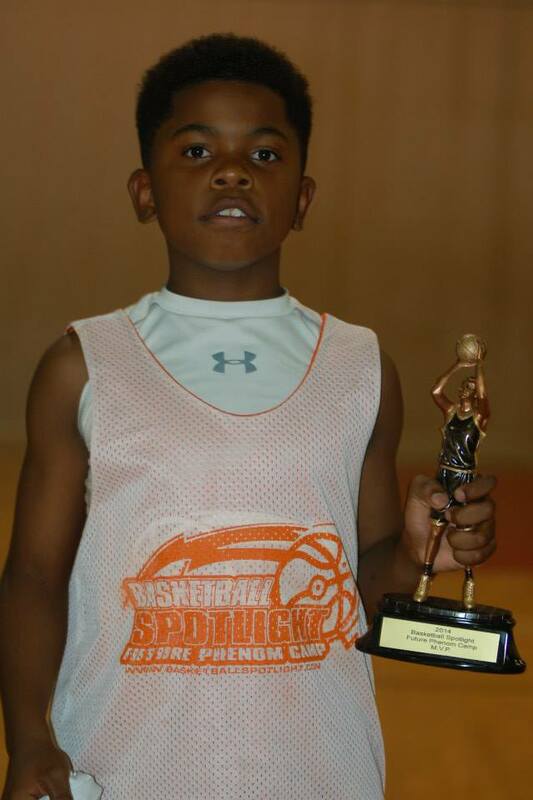 Gunning For #1: Evans Eager To Deliver At Spotlight Future Phenom Camp! “The CEO” will make his Future Phenom Camp debut in his home state, but clearly won’t be making anyone feel at home during their stay. The players like Evans in the class of 2020 you can count on one hand; he joins the party after playing the 2015 season in the loaded 2019 class. 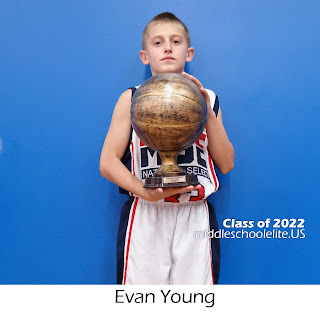 Opponents have no need to apologize, don’t be sorry be careful as Evan’s poses a problem on both ends of the floor and is will immediately be considered one of the most versatile players in the class. Just as happy to drop it off as he is to finish which he does very well. We are looking at a top 5, top 10 kid potentially and this is where he intends to prove it August 22nd and 23rd. At 6’6 handles like a PG, but can defend multiple positions on the other side as well he is a defensive problem especially from the weak-side. You see that he is being groomed for two-levels up and you can see he has the tools to make it happen, the upside is ridiculous for the kid as Evans is a consistent jump shot away from being one of the most dominant players in the country. Only problem? The jumper is looking better each time we see it. This is the type of talent you will see at the Spotlight we hope the country is ready. Gunning For #1: Roach Ready To Take On Countries Best At Future Phenom Camp! One of the hottest names in the country right now is Jeremy Roach who had a breakout year making an impact on the national scene; Roach has competed in every top event and impacted the outcome with his dynamic play. Roach will make his Spotlight debut joining the star-studded list of camp commits out of Virginia. 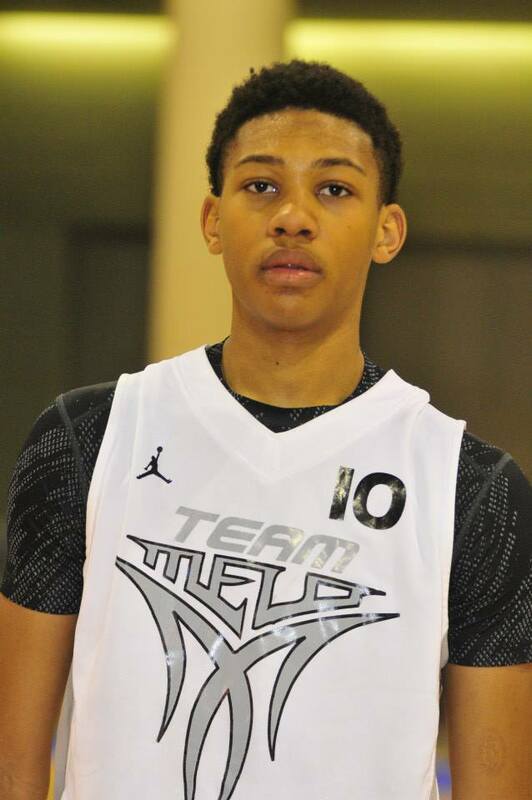 Roach’s recent performance in leading his Team Melo squad to the national championship was epic; the question is no longer “is he the best guard in the DC Metro area?” rather it’s “is he the best guard in the country”. Jeremy is effective at all 3-levels and possesses a handle and range combined with a nose for the paint – yet his IQ allows him to make the necessary reads to make the right play for himself or his teammates and he remains a willing passer even with his elite level status. If you considered him under the radar before, many knowledgeable basketball minds have seen this coming for years, he is now center stage and be careful you may be starring in his next video if you take the floor against him; August 22nd and 23rd only real players need apply to go head to head against this guy. 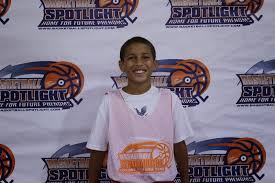 Gunning For #1: Hoggard Ready To Hold It Down At Spotlight Future Phenom Camp! We all know the name and you have to love the game the PA native has to be considered one of the toughest covers in the country. The big PG can flat out do it and has flat out done it all year long often saving his very best for the biggest stages and biggest games. The Team Melo/Terror Squad did it all year with a target placed squarely on his back and responded with big performance after big performance. One of the best natural passers regardless of the class – this is truly his marker and separator showed he can score with the very best out there. With swag personified coming face to face with Hoggard will be a daunting task for anyone in the building during the Spotlight Phenom Camp weekend. I'm sure folks won’t be scared, or will they? One of the craftiest ball-handler out there he does a lot with the ball in his hands - spaces the floor well with the ability to bang the jump shot, shows a high level of proficiency in the mid-range and with the floater and has the frame to absorb and finish through contact . A seasoned floor general who’s played in big game after big game and gotten the job done AJ makes the most of opportunities – he can lead the team in scoring as well as assist any time out, one word? Special. One camp? Basketball Spotlight Future Phenom Camp. 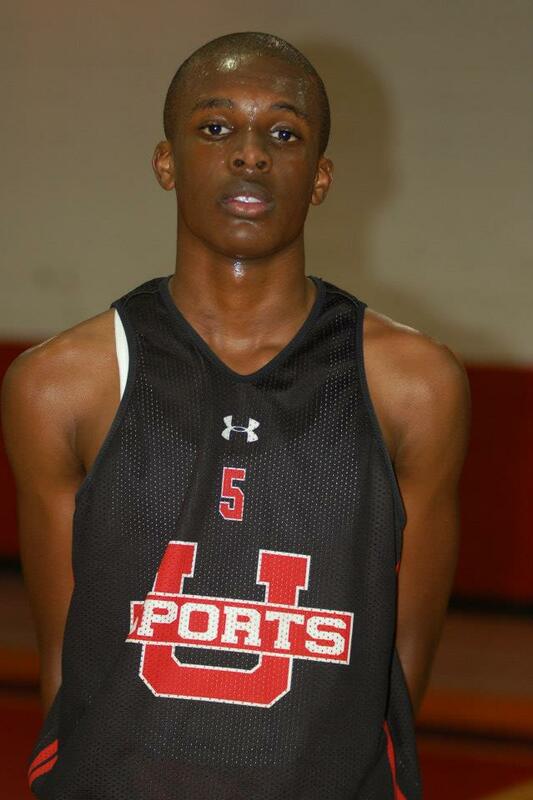 Gunning For #1: Moore Brings Texas Flavor To Spotlight Future Phenom Camp! The Texas native is already considered one of the nations and will be in attendance at this year’s Basketball Spotlight Future Phenom Camp. Moore walks into the gym already with a national reputation; he will be expecting to build on that with more impressive performances. We love his athleticism and his strength; he has exhibited impressive body control and does a ton of things off the dribble. One of the best pure transition players in the class due to the high motor and energy that he brings to the game – he brings it on both ends where he is solid guarding multiple positions. The IQ is also apparent and plays a big part of his success within the 94-feet. He is coming to the Spotlight as a player who respects the game and enjoys the process of getting better. Anyone stepping on the floor with this kid come August better bring their A-Game as Moore only knows how to play one way and that’s hard. We’ll be watching to see who can keep up. Stay tuned as we bring you more top players coming to the Spotlight Future Phenom Camp. Breakdown: I made a trip to the Moody Park Summer League to check out Sorber. The young forward is currently 6’5 but has the chance to grow to about 6’9. He’s still in the developing stages but was able to be a factor down low on the blocks. He has good hands and decent touch but will have to work on his foot work and learning his way around the floor. 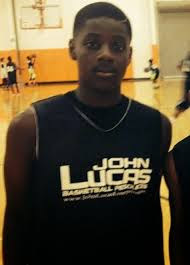 He’s scheduled to attend state power Trenton Catholic Academy where he could be their next superstar down the road. His next challenge will come next week when he travels to the 14U AAU Nationals with the NJ Wolfpack. Basketball Spotlight will keep an eye on this kid. The 13U AAU Nationals took place in Greensboro, NC and Basketball Spotlight was in the building. We got a chance to see some of the top players in the country at this event. Here’s our last recap from this event. Xavier Dusell Guard (Oakland Soldiers)- Dusell is a legit wing and one of the best prospects I saw with this group. He has a fluid outside shot and runs the floor like a deer. Oakland Soldiers used Dusell to spot up when spreading the defense and he also launched the 3 point in transition. His shooting help put away a stubborn Team Charlotte in bracket play. Kendall Munson Forward (Oakland Soldiers)- Munson was the inside force for the West Coast squad. He has decent leaping ability and fights hard to get position. He used good touch to finish off passes on the post. He runs the floor well but I didn’t get a chance to see him handle the rock much. As he develops this should be an area of emphasis for him. Josh Christopher Forward (Oakland Soldiers)- Speaking of running the floor Christopher gets it done in transition. He a superb athlete and one of the best finishers I saw at this event. I also feel he could very effective on the defensive end by playing passing lanes and guarding multiple positions. 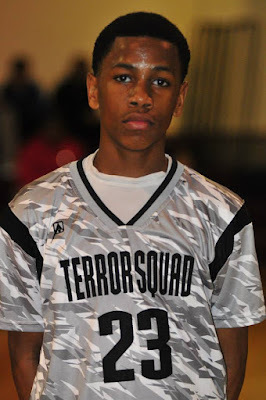 Jamir Thomas Guard (Oakland Soldiers)- Thomas battled back after having early trouble with the Team Charlotte pressure. Once he settled in he was able to make some big plays down the stretch including clutch free throws to help them seal the deal. Elijah Pickens Guard (Team Manimal)- The Chicago squad lost to Team Melo in bracket but this kid came to play. He stretched Team Melo defense with treys from the cheap seats. Pickens was seen launching treys a few steps past half court. He may be small in size but was big in stature and the heart of a lion. His range was remarkable. Tyrelle Afunt Forward (Team Manimal)- Built like a linebacker Afunt was a force on the glass and playing defense for the Chicago squad he did all the dirty work including boxing out and grabbing boards. He led the physical charge for this squad all week. Noah Harris Guard (King Street Kings)- I got a chance to see KSK battle hard against the Gauchos and was impressed with the play of Harris. This kid had the 3 ball dropping with all types of bodies running at him. Harris has a sweet stroke and wasn’t afraid to pull the trigger on the frontline. 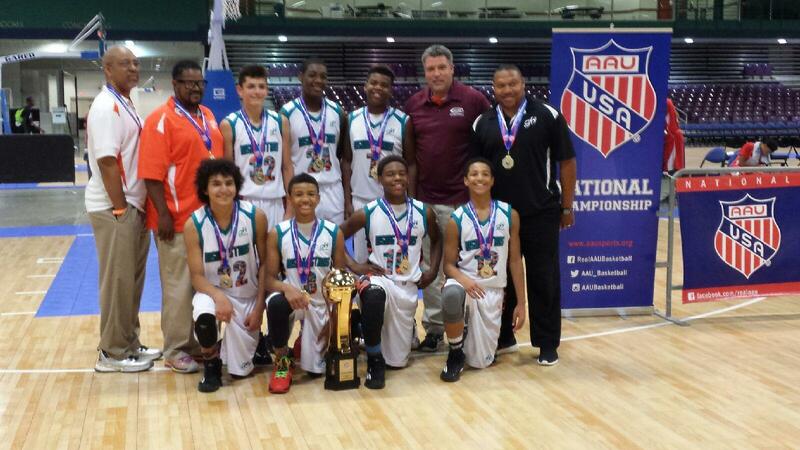 The 13U AAU Nationals took place in Greensboro, NC and Basketball Spotlight was in the building. We got a chance to see some of the top players in the country at this event. Here’s our third recap from this event. Tristan Maxwell Guard (Team Charlotte)- Tristan is similar to his father Mad Max (Vernon Maxwell) in terms of quickly becoming the life of the party. The combo guard repeatedly heated up from deep, mid-range and finishes at the cup. He was able to operate around the pick and roll or the high screen. In transition he beat the defense down the floor and score easy on backpedaling defenders. He constantly puts pressure on the defense. He is a certified scoring threat from anywhere on the floor. 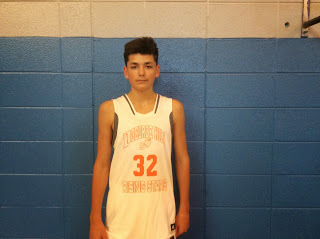 Josh Rubio Forward (Team Charlotte)- Rubio became a scout favorite and a opponents nightmare. The wide framed forward scored with ease on the blocks and made a living carving out position. He has an intimidating posture and plays with great aggressiveness. What’s the most intriguing aspect of his game is his court vision. This kid made it his business to hit teammates on the fly and cutting through the lane. His unselfish play stood out and helped his squad be successful. Brock Williams Guard (Team Charlotte)- Williams is a hard-nosed point guard with some quickness and sneaky athleticism. He squeezes through gaps in the defense while also dishing to teammates or finishing off plays himself. When you throw in the type of defense he plays he’s definitely a player you wouldn’t mind being in a foxhole with. Joshua Taylor Forward (Atlanta Volt)- Taylor a good on the eyes as he sled deep in the post and used Tim Duncan type touch to finish against NY Rens. I like his length which looks to be stretching out more in years to come. Naturally at this age he does need to add strength but when it all comes together the ATL might be looking at their next star. An immediate impact player. 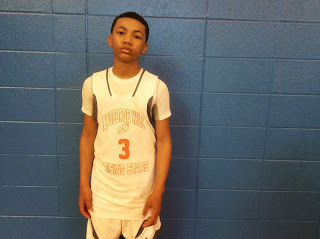 Caleb Murphy Guard (Atlanta Volt)- Murphy stays in attack mode and enjoys breaking down defenders. He has the talent to weave his way through traffic on his way to the tin. I like his size for the guard spot and his knack to get rid of defenders. He has a toughness you can’t teach. Davon Smith Guard (Atlanta Volt)- A natural pass first point guard Smith can get anywhere he wants on the floor. He has an array of dribble drive moves and will put some mustard on his passes. As he gets older he will learn not to play with the rock as much but instead make a move and go. George Hill Rising Stars put together a spectacular week and defeated Team Melo 59-45 to win the 2015 13U AAU National Championship. As usual the Indiana crew had a balanced attack and played excellent defense. Coach Mike Saunders Sr. is very happy with his team’s success, “Winning the National Championship felt great because of how hard the boys worked. They grew up right in front of my eyes. They won the national title and showcased their skills. I was a fan all week” said Saunders. Basketball Spotlight would like to congratulate George Hill Rising Stars and Coach Saunders for getting the job done. We feel that Coach Saunders has to be considered one of the best AAU coaches in the country. 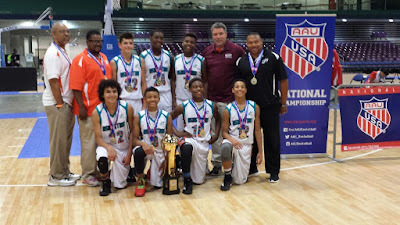 The 13U AAU Nationals took place in Greensboro, NC and Basketball Spotlight was in the building. We got a chance to see some of the top players in the country at this event. Here’s the first of many recaps from this event. Jeremy Roach Guard (Team Melo)- In the past the AAU Nationals was the launching pad for many new names and now you can add Jeremy Roach to this list. The Potomac Valley lead guard took over this showcase. His body control and ability to get through the defense was un- matched at times. Roach was a huge outing against the St. Louis squad while scoring 40 points and taking over the contest down the stretch. His next victim was Team Loaded in the Elite 8 game as Jeremy went on a 14 straight point scoring outburst to put his team in the Final Four. Later that night he drove coast to coast with 5 seconds left to hit the game winner over the Gauchos and place Team Melo in the National Championship. I’m not sure if AAU gives out a MVP Award but he would certainly get the nod. 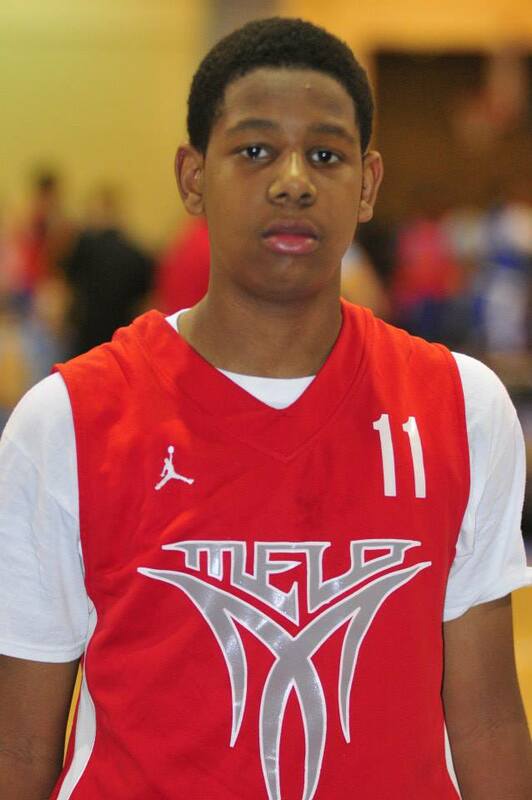 Montez McNeil Forward (Team Melo)- The big fella had his moments throughout the weekend. He got good post position and showed good footwork for a youngster this age. He added some scoring punch inside and ended on contest with a triple-double. But on the defensive end he plugged the inside while being the primary shot blocker and rebounder. He showed amazing patience being able to stay out of foul trouble while still being effective. This kid’s upside seems tremendous. Ryan Conway Guard (Team Melo)- Conway found his shot during the round of 16 and 8. He added the outside touch and scoring ability in transition. When defenses collapsed on McNeil or doubled Roach he made them pay with a strong drive or a trey ball from the corner. His scoring contribution definitely helped them get to the finals. Trey Galloway Guard (George Hill Rising Stars)- GHRS game versus Oakland Soldiers was featured as the big game of the day and Galloway came to play. First he opened up their defense with 3 long treys. Then when the West Coast squad tried to over play him he attacked the basket and used body control to finish around the rim. He has the unique ability avoid shot blockers while finishing at the tin. Mike Saunders Guard (George Hill Rising Stars)- Saunders aggressive defensive style had him battling foul trouble but he was still able to help them reach the finals. He’s a true floor general and knows how to pick his spots on offense. He penetrates at will and isn’t afraid to take the big shot. He his three pointer against Oakland Soldiers deflated the defending national champs. 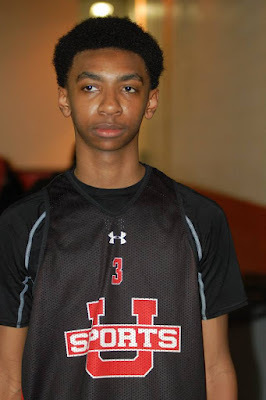 Brevin Jefferson Guard (George Hill Rising Stars)- Jefferson is another tough guard with this group. He plays either guard position and also plays lock down defense. In transition he gets up and quickly and converts in traffic. Kenny Tracy Guard (George Hill Rising Stars)- Tracy also showed during their showdown with Oakland Soldiers. Not only was a total pest on defense but he nailed a few big treys to that stretched the lead for his squad.